1.1.2 Chapter 2: Does Polyarchy Matter? 1.1.4 Chapter 4: The Socioeconomic Order: Concentration or Dispersion? 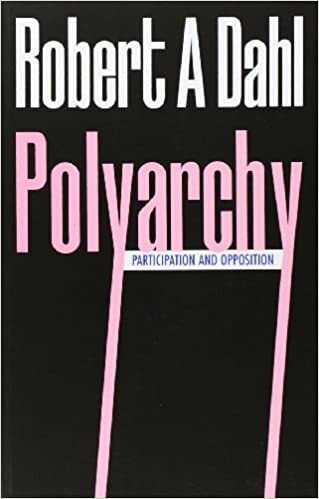 Polyarchy was written by Robert A. Dahl and published in 1971. Dahl's purpose of Polyarchy is to determine conditions favor or impede a transformation into a political regime in which opponents of the government can openly and legally organize into political parties in order to oppose the government in free and fair elections. Dahl assumes that a key characteristic of democracy is the continuing responsiveness of the government to demands from its citizens. Since it is almost impossible for a government to be responsive to all of its citizens, Dahl calls our everyday conception of democracy "Polyarchy." Dahl next mades the distinction between Public Contestation and Inclusiveness. In a democracy, public contestation is the amount of elections held. Inclusiveness is the proportion of the population entitled to vote or participate in the public contests. Thus democratization is made up of as least two dimensions: Liberalization (public contestation) and Inclusiveness (the right to participate). Closed hegemonies have low liberalization and low inclusiveness. An example is an unelected monarchy. Competitive oligarchies have high liberalization and low inclusiveness. An example is Britain and the United States when only property holding males could vote. Inclusive hegemonies have low liberalization and high inclusiveness. An example is the Soviet Union, where everyone voted for the only candidate available. Polyarchies have high liberalization and high inclusiveness. Examples include the United States and other advanced western countries with universal suffrage and low limitations on running for public office. Dahl restates his central question. What conditions increase or decrease the chances of democratizing a hegemonic or nearly hegemonic regime? More specifically, what factors increase or decrease the chances of public contestation? Even more specifically, what factors incrase or decrease the chances of public contestation in a highly inclusive regime, that is, a polyarchy? Finally, Dahl states that a situation where the costs of toleration of the opposition are low and the costs of repression of the opposition are high would increase the probability that a regime will be competitive. Chapter 2: Does Polyarchy Matter? The lower barriers to public contestation and the greater the proportion of the population included in the political system, the more difficult it is for the government of a country to adopt and enforce policies that require the application of extreme sanctions against more than a small percentage of the population; the less likely, too, that the government will attempt to do so (pp. 27). Dahl comes to the conclusion that polyarchy does matter, and that it is frequently desirable. The benefit of such a system outweighs the cost of such a system. Finally, the study of polyarchy is important because the most favorable conditions are uncommon and are difficult to create. A. Closed hegemony becomes a competitive oligarchy by offering public contests to a select group of individuals. B. The competitive oligarchy becomes a polyarchy by enfranchising more of the public. Examples: Great Britain and the United States. A. Closed hegemony includes the public in its activities. B. The inclusive hegemony becomes a polyarchy by increasing chances for public contestation. Example: Germany from the Empire to the Weimar. III Liberalization and inclusiveness occur simultaneously. Dahl speculates that the reason why paths II and III are more difficult that I is because more people involved means more differences of opinions and interests need to be considered, rendering decisions and process difficult and complex. He also speculates that while path I is the safest and most reliable, it is unlikely to happen frequently in the future because most hegemonic regimes are already inclusive. The best processes to polyarchy leave few cleavages or doubts about the legitimacy of the government. Peaceful evolution is the most likely to yield the above result. Any process that leaves a large segment of the population opposed to the legitimacy of competitive elections is bad. There is likely an effect of social proof on changing regimes. More polyarchies may lead others to develop that way. The process of becoming a polyarchy can be eased by a popular search for mutual security. Chapter 4: The Socioeconomic Order: Concentration or Dispersion? The central questions of the chapter are Do some socioeconomic orders affect the probability that a hegemony will change to a competitive regime more than others? and Are the chances that a polyarchy will remain so dependent on the socioeconomic order? Important Axiom: The government will tolerate the opposition more as its capacity to use violence or socioeconomic sanctions on it diminishes. The most favorable circumstance for competitive regimes is one in which access to violence and socioeconomic sanctions is either displaced or denied to both the opposition and the government. A competitive regmine or polyarchy is unlikely to be maintained without a pluralistic social order. A centralized social order is conducive to a hegemonic regime. A competitive regime cannot be maintained where the military or the police routinely intervene in politics. This chapter deals with the question of whethere higher socioeconomic development leads to more competitive regimes. Dahl addresses the possibility of "thresholds" and of "deviant cases." among the politically relevant elements of society. Basically, resources equal political power in the long run. Dahl allows for the possibility that it is possible that even if government policies that try to reduce inequality fail, the effort may be enough to mitigate the complaints of the deprived group. Dahl demostrates through the examples of Athens and the United States, that it is possible to develop and sustain a system that is both competitive with respect to the dominant group and hegemonic with respect to a minority population. Dahl presents a study that came to the conclusion that people often judge their situation on the perceived direction of change of the larger collective with which they identify themselves with. There are many subcultures that individuals are socialized. Ethnic and religious conflicts are oftentimes the most contentious conflicts because assaults on ethnicity and religion are assaults on a fundamental characteristic of person. Dahl lays out three conditions for countries that have many subcultures in order to maintain low conflicts and thus polyarchy. Conflict is likely to be low if no minority or ethnic or religious subculture is denied the opportunity to participate in the goverment. There are direct or indirect guarantees that provide a high degree of security for the various subcultures. The chances for a polyarchy are more likely if the people think that the government is addressing the important problems that the country faces. The two significant political institutions are the relationship between the executive and the legislative, and the political parties. The ideas the political activists must be treated as an independent variable.